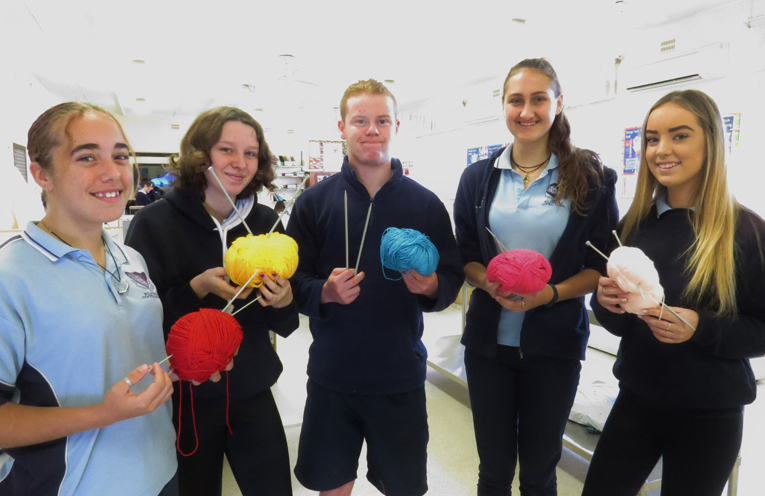 Ready to Knit: Jason Onley, Caitlin Swain, Tahlia Mancini, Kristyl Bartyn and Heidi Buchanan. 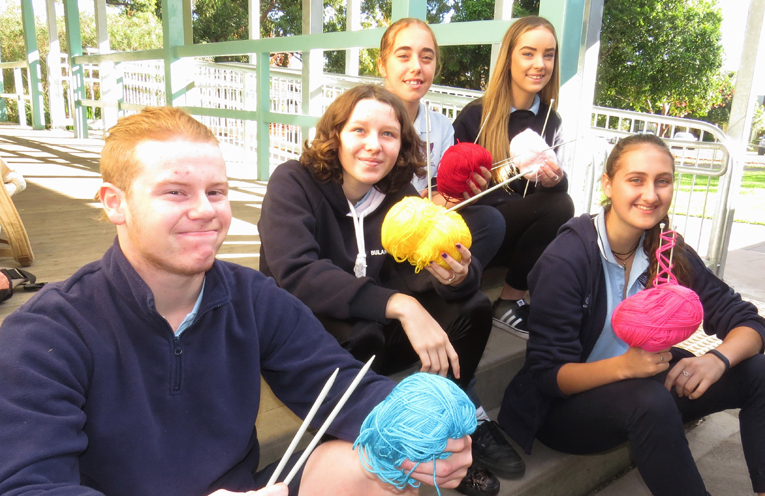 THE clickety-clack of knitting needles will be a familiar sound at Bulahdelah Central School when a group of students begin casting their yarns, purling a few and passing slipped stitches over. Although it might take a lot of patience at first, the teens are looking forward to learning to knit as part of their school elective course in Textiles and Design. Class member Jason Onley said with the assistance of community volunteers, each of the 18 students will start by knitting a square to be made into a rug for charity. “We want to donate the blanket to a good cause, it’s a nice way to support the community especially with something we will enjoy working on,” he said. The traditional skill, which was once passed down through family generations, is bound to find new fans amongst the students who will also be given the opportunity to knit a teddy bear, beanie or scarf. “It’s exciting to have the opportunity to learn these skills that can translate across to other areas,” class member Tahlia Mancini said. To help get their project off the ground, the students are seeking donations of knitting needles and wool. Class teacher Mrs Elizabeth Smith said although 4mm needles and 8 ply wool will be ideal, they will be grateful for any size or colour. “All donations will be greatly appreciated and can be left at the school’s front office,” she said. Ready to Knit: Tahlia Mancini, Caitlin Swain, Jason Onley, Heidi Buchanan and Kristyl Bartyn.